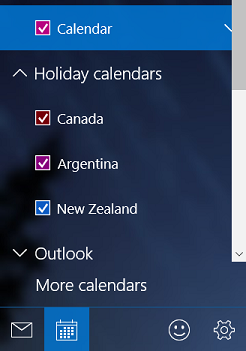 You can now add a holiday calendar directly from the Calendar app in Windows 10. In the left pane, choose More Calendars. Scroll through the list of holiday calendars and select the check box next to any holiday calendar you want to add. Your holiday calendars will be listed in the left pane and the holidays on those calendars will show up directly in your calendar. Note: If you don't see More Calendars in the left pane, you may need to update your Calendar app. See Update Mail and Calendar for Windows 10 for instructions. You can permanently remove your holiday calendar or temporarily hide it. Scroll through the list of holiday calendars and select the check box next to any holiday calendar you want to remove permanently. Clear the check box next to the holiday calendar you want to hide temporarily. How do I switch my view in Calendar for Windows 10? How do I print in Calendar for Windows 10?